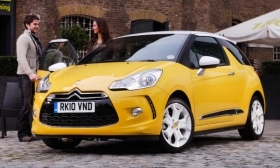 Vehicles such as the upscale Citroen DS3 minicar are giving PSA a boost. PARIS -- PSA/Peugeot Citroen SA posted a 10 percent first-quarter revenue gain because of new models and said Japanese supply disruptions haven't compromised its full-year earnings targets. Sales rose to 15.4 billion euros ($22.2 billion) from 14 billion euros a year earlier, helped by the introduction of vehicles such as the upscale Citroen DS3 minicar, Paris-based PSA, Europe's second-biggest automaker, said today in a statement. That compares with the 14.9 billion-euro average estimate of four analysts surveyed by Bloomberg. "Hats off," David Arnold, a London-based analyst at Credit Suisse, said today in a note to clients. "The market will take today's statement as positive, given the higher degree of confidence the company shows about the near-term earnings environment." Peugeot stuck to its forecast of a gain in automotive division operating profit in 2011, predicting that spending cuts will outpace raw-material cost gains and make up for an estimated 150 million-euro drop in first-half earnings from the effects of the March 11 earthquake in Japan. The automaker said it will propose to reinstate a dividend of 1.10 euros on 2010 earnings after scrapping the payout for two consecutive years. Peugeot rose as much as 4.9 percent to 28.49 euros, the biggest intraday jump since Jan. 11, and was up 4.4 percent as of 9:15 a.m. in Paris trading. That narrowed the stock's decline this year to 0.1 percent. The manufacturer is benefiting from a decision not to scrap or delay vehicle programs during the 2009 economic crisis, with new models such as the DS3 minicar and Peugeot Hoggar pickup helping the company defend pricing and bolster deliveries in emerging markets. Under CEO Philippe Varin, the automaker aims to generate more than half its sales outside Europe by 2015 compared with 39 percent last year. In the quarter, non-European sales rose to 38 percent of the total from 33 percent a year earlier as Peugeot increased its share of the Latin American market to 6 percent from 5.3 percent. Auto-division revenue rose 6 percent as a shift by consumers toward pricier models such as the DS3 more than compensated for a 2 percent decline in pricing, Peugeot said today. While Japanese supply disruptions have been contained for now, "output in Japan has yet to return to normal and the group is carefully tracking the situation," the company said. Some Peugeot plants temporarily slowed production by as much as 60 percent last month because of a shortage of Japanese-made Hitachi microprocessors used in its diesel engines.